I had a 2004 wrx we put in a light weight flywheel and stage 2 clutch and the transmission made horrible noises. Will this have the same effect on a 2011 wrx? A: This clutch kit and flywheel will be louder than the stock clutch and flywheel due to the lighter weight flywheel. Also, the springs on the clutch disc make a chattering noise as well. I picked this clutch up without the flywheel and went to install it and couldn’t because the stock flywheel was too small for the clutch plate. Was this just something I was confused on or has anyone experience similar issues? A: This clutch does not fit OEM flywheel, you will have to use the flywheel in this kit. A: There should be no concern with running this clutch on a stock setup or under the advertised power rating. I always recommend having a clutch rated higher than what the car makes. A: Your answer is to not buy this product from drug users like the owner Chris Jewel and the warehouse supervisor named Kevin Powers! Everything is from China with a Competition Clutch Logo slapped on it. A: No, you will not need a tune for a clutch. A: This is not recommended to be used with the OEM flywheel. With this flywheel you should be fine running it without a CEL. What are the install torque specs on this kit? A: This kit will use the factory torque specs. Please refer to your factory service manual for exact specifications. Will this light weight fly wheel throw a CEL? A: We have not had any reports of this flywheel causing the check engine light to turn on. 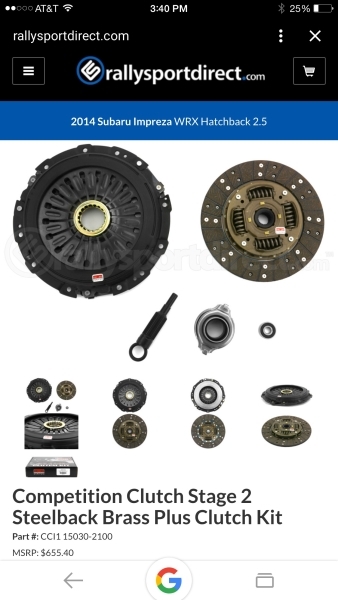 if I were to buy the exedy oem clutch replacement, would I be able to continue to use the flywheel from this competition stage 2 kit that I currently have installed? Or would I have to return to an oem flywheel as well? A: For best performance we would recommend using an Exedy flywheel. However this flywheel will work, but I cannot confirm performance results. Is a pro-tune recommended for this kit, or will the Cobb AP stage 2 tune suffice? A: There is not tuning required for a clutch. Does the factory Subaru flywheel worth with this application if you decide not to use the lightweight flywheel? A: The OEM flywheel will not work with this clutch, the diameter is different than OEM sizing. '06 WRX. Just installed. Less than 50 miles of break-in. Chatters like crazy only at pre-engagement (while slipping.) When engaged or fully disengaged there is no vibration or noise. Chatters in any gear, up or down shift. Lots of smellin' also. Is this normal during the break-in period? A: Chatter can be normal on break-in, it is recommended to break in the clutch in situations similar to stop and go traffic where you are using the clutch often. After about 500 miles the clutch should operate normally. Is this kit all i would need to purchase when upgrading my clutch? My car makes 312 tq at the wheels, would this be a good clutch for daily driving in a small city? Or would it be too much? A: This would be a great option for a city daily driver! Pedal feel will be close to stock. I have a 2010 Wrx with some mods it is currently pushing 312whp. Would this make a good clutch for daily driving? My clutch is oem as of right now and it is going out, would this be too big of a jump? Would it be bad for city driving? A: This clutch is a good option for a daily driver. The torque capacity is 450WTQ so you will have plenty of room for future mods. Pedal feel will be very close to stock. I had an ACT Heavy Duty performance street clutch and streetlite flywheel installed a year ago, it is now in the shop in need of another kit. The clutch fork was bent and broken, I was told the pressure plate was too stiff for the stock fork. I'm now looking to install this kit, can you please tell me if I need a better reinforced fork? And can these pressure plates cause issues to stock clutch forks? Thank you. A: This kit is made to use the stock clutch fork and you do not need to upgrade it. The stock fork design is not great for upgraded clutches in general and it is recommended to inspect the fork during installation. It is possible that this kit could cause extra wear on the stock clutch fork, but it is unlikely. Hello iam very interested in this set up. How ever, it says there is a 500 mile break in period. I know that you want to have a lot of stop and go driving and keep your rpms under 4000. And shift at different rpms. But iam concerned that I live 20 mins outside of town and have some time on the highway. Will this affect the break in period? Like should I pull over every couple of miles then take off again? Or should I drive the car in town for a few hours after I put the clutch in before hitting the highway for the first time? And lastly I have read that some people have had cel issues with the lighter flywheel. I have the Cobb ap/ intake/ a cat back exhaust. Most people have said tht it is a combo with the lightweight flywheel and crank pully. If I keep the car with the mods that I have in it now and not put a lightweight crank pully. Will I have any issues? A: City driving is recommended during the break in period, but highway driving will not negatively affect the clutch. Highway driving should not be counted towards the break in period and you can do a mix of both if you extend the break in mileage. The only time we have seen issues with a check engine light is if a very lightweight flywheel is paired with a lightweight crank pulley and it has not been an issue with this flywheel so far. Would I need to change the flywheel if I were to get this kit. A: This kit includes the flywheel and does require using it with this particular clutch kit. A: As per confirmed applications, this will work on a 2008 WRX. have clutch and pressure plate and misplace my flywheel from this kit what is the part number for the corresponding flywheel? A: 2-671-ST is going to be the Competition Clutch flywheel part number. This is a 02-05 WRX flywheel part number but when paired with this specific clutch kit it works great. Lightweight flywheel or pulley, it's a WRX's choice of one of the other. I know a lightweight pulley is supposed to be similar to loosing 100lbs of vehicle weight. From a performance/driving improvement standpoint, which would be the better choice? I also have a Cobb AP, can the check engine light be turned off with the Access Port? Thanks. A: A lightweight flywheel will make more of a noticeable difference than a pulley and you can use both together as long as the flywheel is not too light. If the CEL is turned on due to a lightweight flywheel and pulley, then you can turn the code off, but you would more than likely still experience issues, which are usually random misfires. A: We strongly recommend a full faced disc for daily driving because it will engage smoother and last longer. Puck style discs are generally not recommended for anything other than a track car, especially for AWD cars. This clutch kit will work well for both daily driving and track use. How would you go about fixing the cel if it happens to come on when this clutch is installed? A: It is very rare when somebody does run into an issue with a check engine light, and in most circumstances it is when they have a very light sub 10 lb flywheel coupled with a lightweight crank pulley. If this check engine light is encountered there is no way we know of to avoid it, the code could be cleared but will likely come back soon after. A: Comp Clutch does not list a increase % of pressure plate clamping over stock, but it will be noticeable in the pedal. However most people will get used to it in a few days, so its nothing drastic. on average how long would you say would this clutch last for a mostly stock wrx being spiritedly daily driven? A: The lifespan of this clutch should not be much different than the OEM unit. This does depend greatly on how the vehicle is driven and abuse of the clutch will always shorten lifespan. My clutch is slipping and I am looking for an upgrade. I have an Cobb SF intake, SPT exhaust, and a Cobb 3inch downpipe(w/Accessport Stage2 OTS tune). Would you recommend this setup for me? A: This clutch will be more than enough for your modifications. and will be fine for daily driver. A: We have not had any issues with chattering or feedback from customers using these kits who have complained about chattering either. Can I install this with Perrin crank pulley? A: Both a lightweight flywheel as well as a lightweight crank pulley can sometimes cause issues and throw a check engine light. It would not be recommended to install both but there is a chance you wouldn't see a problem. How much lighter is this flywheel comnpared to OEM? A: Depending on the year the factory flywheels are about 20-28lbs, this flywheel is rated at 18 lbs. A: Just to be clear, the flywheel I received weighed in at 13.87 lbs. Big difference between 18 and 13. I can't say with 100% certainty that the one I received was the correct flywheel as it wasn't individually labeled in the box... but I'm assuming I got the correct flywheel. A: Thank you Boyd for noting the weight. I weighed one we had here in stock and the flywheel included in the kit is indeed coming up at around 13.7LBS on our scale. Does this kit come with throw out bearing? A: Yes the throw out bearing comes included in the kit.